Villanova’s Donte DiVincenzo talks with the media after Monday’s practice. 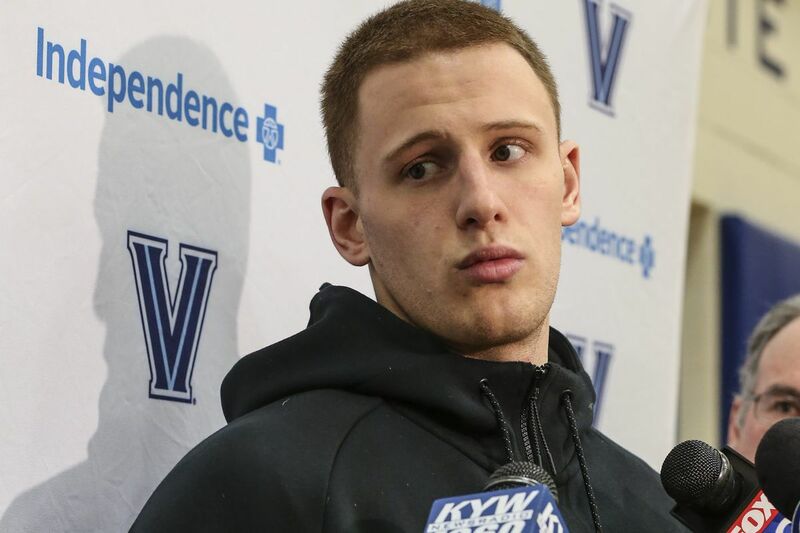 After leading Salesianum High School in Wilmington to back-to-back Delaware state championships in his final two years, Donte DiVincenzo probably figured he'd come to a loaded Villanova program with a chance to make an impact. It didn't go very well at the start. He scored 15 points in eight games before a fractured metatarsal bone in his right foot sidelined him for the rest of his 2015-16 freshman season. During that idle time, he figured out that any role was a role worth accepting. "It was a big adjustment," DiVincenzo, now a redshirt sophomore, said Monday after being rewarded for his role on this year's Wildcats, winning the Big East Sixth Man Award. "I was the main guy in high school and coming here as a freshman, I learned sitting out my year. That's when I learned to really take my role and run with it. When I was sitting out, I just tried to do the best I could for being [on the scout team]. Last year I just tried to be the best role player I could be coming off the bench. "And the same thing this year, there was no different pressure. There was nothing more for me to do other than what I did last year, just more minutes to play, and that's it." game, third on the team. He was the Wildcats' third-leading scorer with a 13.8-point average, and contributed 4.6 rebounds and 3.4 assists. He set a career high with 30 points in a Feb. 10 win over Butler, and dished out nine assists, with just one turnover, in the Feb. 17 victory at Xavier. Jay Wright, whose Wildcats are preparing to play their first game Thursday night in the Big East tournament against the winner of Wednesday's Marquette-DePaul opening round game, said he was proud of the adjustment made by DiVincenzo when he came to the Main Line. "He was a true star in high school and it's hard for a star to learn how to play off the bench and be really effective," Wright said. "I don't think he'd ever been on the bench in his life. The way he's handled it this year, even though he played starter minutes, but still – you have to prepare yourself for the game, you've got to be ready when you step back in the game. It's been really impressive." Wright also noted the nine games DiVincenzo started while guard Phil Booth recovered from a broken bone in his shooting hand, and called his not missing a beat when he returned to sixth-man status "unbelievable." DiVincenzo said the key is focusing on the role. "It's just not thinking about starting all the time," he said. "You'll think, 'Just because I'm having good games, I need to be in the starting lineup.' Your teammates and coaches respect you even more if you're having good games and you're not worrying about it." The Wildcats boasted the Big East's top sixth man in 2015 when Josh Hart captured the honor. DiVincenzo said he and Hart have spoken quite a bit. "He actually talked to me throughout the year about just staying committed to doing what we do," he said. "It's just a coincidence that we both won it at the same time." Donte DiVincenzo, bottom, of Villanova and Marvin Clarke II of St. John’s scramble for a loose ball during the 1st half at the Wells Fargo Center on Feb. 7, 2018.